This Trimmer Trap engine cover will help ensure that your commercial lawn mower engine receives the protection it needs to have a long life. The engines used on today's commercial lawn mowers are extremely long lived if properly cared for. 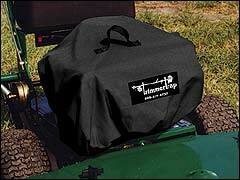 These covers help eliminate problems caused by the elements that shorten your equipment's life. Wind driven rain and dust will find its way into fuel, hydraulic, and electrical systems while transporting your mowers. Stop these invaders before they cause you problems! Adjustable strap and elastic at the bottom securely hold the cover in place. Color: black.